Enoc Cruzado shook the hand of Sue Maggioni, the dean of business and professional studies at MassBay Community College, during a community breakfast in Framingham last fall for the 100 Males to College program. Until his senior year at Framingham High School, the path to college felt like a maze for Enoc Cruzado. But then he joined 100 Males to College, a state program that works with local communities to increase college access, enrollment, and retention for low-income students and students of color. Cruzado and 76 other Framingham students met with “success coaches,” visited local colleges, received help with financial aid and scholarship applications, attended tutoring sessions, and worked at paid summer internships. 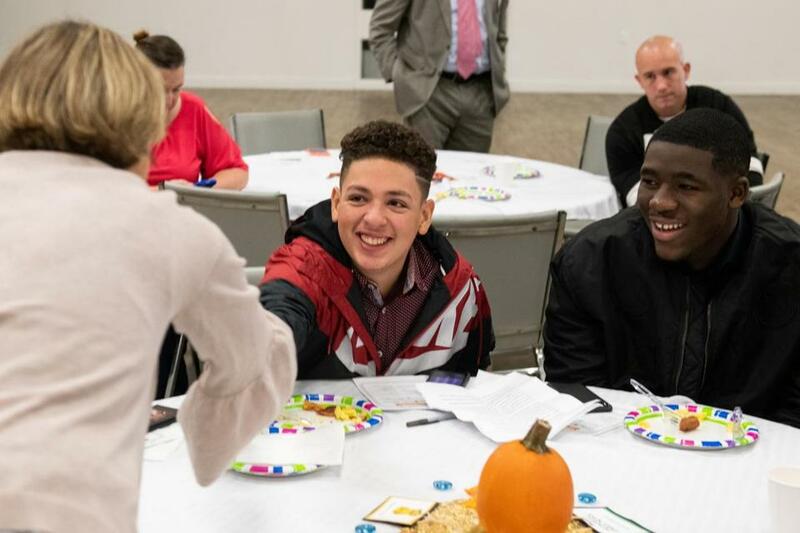 Cruzado joined more than 100 community leaders, politicians, and college administrators at a church in Framinghan this past fall for a community breakfast to praise a program that is changing the lives of underprivileged young men. During the 2017-18 school year, 378 students in the state participated in the program. So far, 92 percent of them have enrolled at a college after completing high school. The 100 Males to College program began in 2015 through the state’s Department of Higher Education and is partially funded by the Vision Project’s Performance Incentive Fund, which supports efforts to close achievement gaps among students from different ethnic, racial, gender, and income groups. In addition to Framingham, the program is offered in Brockton, Springfield, Worcester, and most recently, Salem. In September, the Massachusetts Education Equity Partnership, a coalition made up of 17 organizations including the Massachusetts Association of Bilingual Educators, Latinos for Education, and NAACP Boston, presented a report that highlighted disparities in the state’s public schools. “Number One for Some, Opportunity and Achievement in Massachusetts,” said that more than 25 percent of Latino students in the state did not graduate high school in four years, placing Massachusetts 43d among all states in 2016. For students who are not yet proficient in the English language, the graduation rate statewide was 64 percent, placing Massachusetts 29th. After the ceremony at Saint Tarcisius Parish, Portillo said most students he mentors are unaware of federal programs that could lower the burden that college tuition often places on cash-strapped families. At Framingham High School, 27 percent of students are economically disadvantaged and 13 percent of students are not yet proficient in English. The 100 Males to College program in Framingham is a partnership between the school district, Framingham State University, MassBay Community College, the Boys & Girls Club of MetroWest, the MetroWest YMCA, the Jewish Family Service of Metrowest, Chyten Test Prep and Admission, Greater Framingham Community Church, and the MetroWest College Planning Collaborative. Jordan Nantchouang, who joined 100 Males to College his senior year of high school, walked to the stage during the ceremony and said the program helped him become proactive about his education. He is now a freshman at MassBay Community College and is majoring in criminal justice.